l’École de SpecGram, Washington D.C. In the July issue, Speculative Grammarian continued its shameless attempt to cash in on the popularity of the Japanese number/logic game SuDoku by concocting another more-or-less SuDoku-like activity suitable for easily-amused Linguists. Our last LingDoku puzzle, a step up in complexity from the original overly-simplistic LingDoku, was a reasonable attempt at a puzzle that would occupy the competent linguist’s analytic ability for a small amount of time. We won’t go into the details of the rules of the previous LingDoku puzzles here, but the probably correct solution to last issue’s puzzle is given at right. Each of the winners will receive a SpecGram magnet of their choosing. Congratulations to the winners, all LingDokuists Extraordinaire. In this final installment of the LingDoku Puzzle Trilogy, we at SpecGram have once again pushed the evolution of the linguist’s logic puzzle to the next level, bringing forth the ultimate in IPA-based puzzle logic complexity: Samurai LingDoku. Samurai LingDoku extends yet again the previous simpler LingDoku puzzle forms. Rather than nine or sixteen IPA symbols, Samurai LingDoku uses twenty-five, shown below. Instead of satisfying constraints on two features simultaneously, Samurai LingDoku requires optimization of constraints on three features at once: vowel height, fronting, and rounding. The rules of Samurai LingDoku are complex, but rewardingly so. 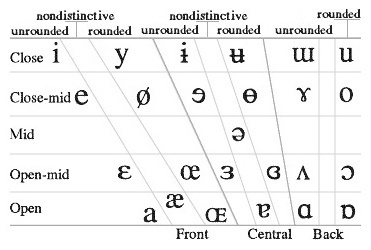 Using the twenty-five IPA symbols provided, a linguist attempts to fill out the three unfinished overlapping boxes. Each symbol occurs exactly once in the solution, and no row or column in a 3x3 sub-box may contain more than one symbol with either the same height or same fronting. As an added constraint, no two symbols with the same rounding (rounded, unrounded, or nondistinctive) may be horizontally or vertically adjacent (though two symbols with the same rounding can—and in fact must—occur non-adjacently in the same row or column). 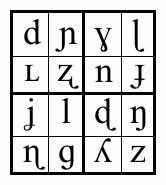 For purposes of this puzzle, some liberties have been taken with the vowel chart. There is no theoretical axe to grind here, just some puzzle-loving linguists having fun, so don’t get your knickers in a knot over the distinctions made here. 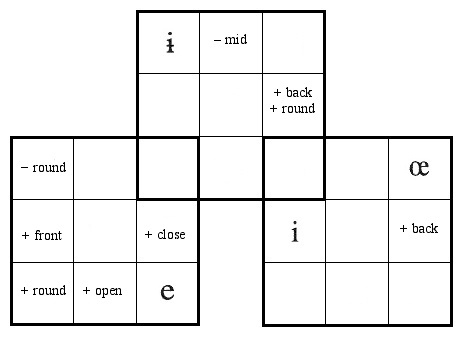 purposes of this puzzle, “- round” means unrounded, “+ close” could be close or close-mid, “- mid” could be close or open, et cetera. A strategy hint: using normal SuDoku techniques, you can solve some of the puzzle separately for height, frontness, and rounding. Once each feature is worked out as much as possible consider constraints on feature combinations. Pay attention to allowable and unallowable combinations. For example, if a box contains a symbol that is both central and rounded, you know its height is not “open”. Those of you who find Samurai LingDoku “too difficult” should take comfort in the fact that you are not alone, but you might still shy away from any serious work in phonology and syntax. Those of you who think Samurai LingDoku is not all that tough should email your solutions to SpecGram. At least one random winner chosen from among those who send in correctly completed puzzles by December 1st, 2006, will earn a SpecGram magnet. The solution (all the usual disclaimers of quality apply) and the name of the prize winners (if any) will appear in the upcoming January 2007 issue.